Looking for some assistance in the Medford, OR area in taking a look at a bike before a purchase. Please PM me if you can assist. Thanks for any assistance. Looking for pickup of a paid bike and shipping from Schenectady to Tempe, label provided. Would need to pick up the bike (paid for already) and then just box it up and attach labels which I'd email to you. Last edited by RobbieTunes; 09-09-18 at 06:38 PM. Ok, this could get expensive for me :-) I ran into bikeforums.net because we are looking to build/restore/ride a pair of '98 Bianchi bikes. I think I found one in the Sacarmento CA area that fits our needs, but it is local pickup only. Auburn more specifically but I don't know any more yet. So anyone active in that area still that could help a newbie like me? Preferred Contact: PM or e-mail through site. Secondary CL Cities: Kansas City, St Louis. Possibly other parts of Missouri. Never one to ask someone to do something I wouldn't do if I could! Any facilitator's in near Jacksonville? Hi, looking it scoop up a bike in Jacksonville. Any BF member available to assist with the purchase? Bikes: 1971 Gitane TDF, 1974 Gitane Interclub, 2001 Serotta Rapid Tour CS3 and 1986 Bruce Gordon touring bike. Help With CL Purchase in Seattle? Looking for a facilitator to do a quick inspection of a bike in Seattle area, purchase bike and bring to LBS for box and ship. Can use Paypal or Venmo to transfer funds. Pls respond with PM if able. Thx! Still looking for help in Indiana. @Moon_mamii I would if I had a car!! I'll likely be in Anderson, Indiana, mid-October. That's about 50 miles or so from Portland. What do you need? PM me. Looking for help near clermont Florida? Looking at a bike in Seattle/Silverdale, WA area. Ok, so there is a little water between the two. It would be nice if I could simply meet someone in Portland, OR for the exchange someday. I’m looking some for help in Pittsburgh PA? Looks like most of the Pennsylvania facilitators are in the Eastern part of the state. I ended up contacting the seller, and pleading my case. I offered to send his asking price through a medium he was comfortable with and asked him to hold the bike until the payment cleared. He ended up bringing it right to his LBS who have packed it up, and are bike flighting it out to me tomorrow. I sent him payment with a moneygram, which leaves me no recourse if he decided to keep the bike, but since I was initiating the deal I thought I was pretty safe. I think my total trust in him sending the bike was what made him feel he could trust me. We ended up having a couple good conversations. He brought the bike to a shop and I called them and payed by phone to have it packed, then the bike flights drop off just happened to be across the street, so they were willing to walk it over for me. I’ve bought the shippining, and forwarded the labels to a Ben at the shop. Should go out tomorrow. I hope so, it’s an ‘84 Trek 620! 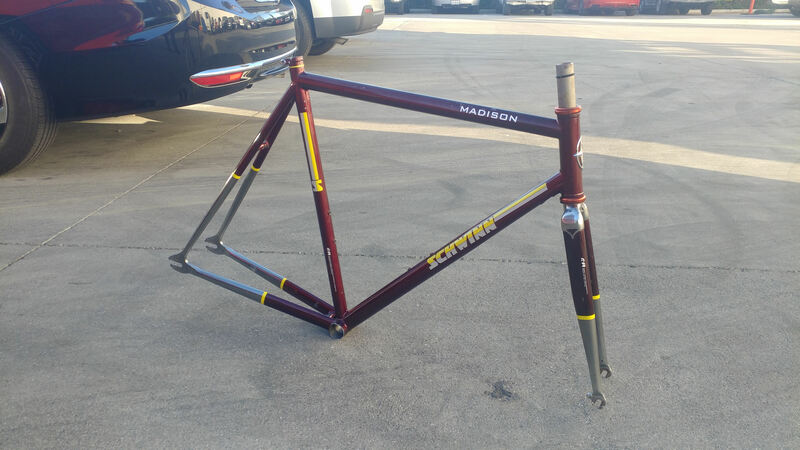 Advertised as a “vintage trek bike” with really dismal pictures. But I recognized the Cantis, and the 600 series on the top tube, then the Vintage Trek sight helped me nail down the year. I’ll find out in a week if I’ve done well. I’m on honeymoon in Florida till Saturday! anyone close to the Pomona area of Los Angelos? talking to a guy about a bike for sale. Would help with the deal for someone to pick up and help with the shipping. Looks like only the frame will need to be sent. Super! Sent you a PM. Last edited by malcala622; 11-09-18 at 09:29 AM. Can anyone in Minneapolis give me a hand? Possible need to pick up a set of downtube shifters, toss 'em in a box and send them my way. Seller is hesitant to ship. I have a fellow with a Park Tool ***-1 Frame Aligning Gauge for sale but refuses to ship. It should be relatively easy to pack and ship. Last edited by malcala622; 11-23-18 at 01:17 PM. Prowler - Thanks again for the help!! !